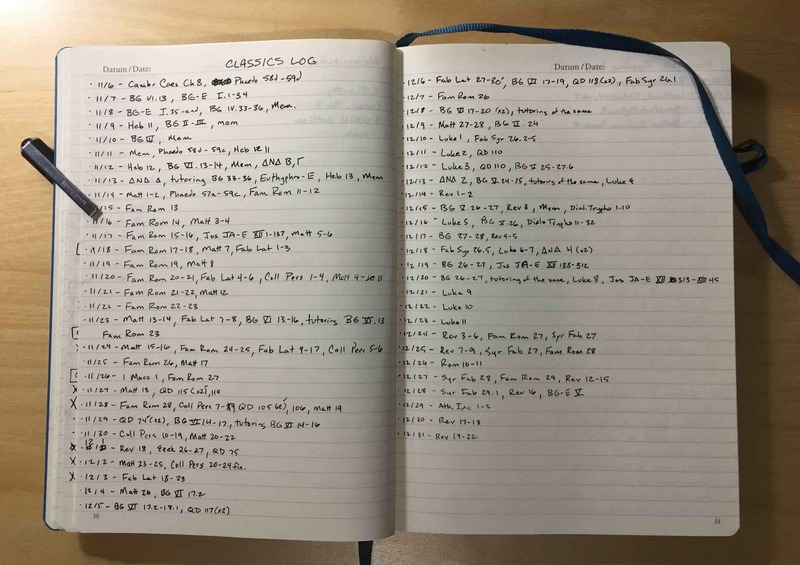 Everyone has wanted to see it and many have been begging for it — behold, my 2018 Q4 classics log! It is rather late this time. I had some technical difficulties, so I decided to take this opportunity to rewrite the blog in Python/Flask (something I have wanted to do for a while), and move it to Heroku. Anyway, that is done. Back to the subject at hand. If you want to see records of old successes, failures, and clear proof that I can set concrete goals and ignore them for other shiny language activities, here is Q1, Q2, and Q3. Just in case you were wondering, this is what the analog version of my log actually looks like. I failed pretty hard in my classics reading again, even though I did more this quarter than the previous. Specifically, I did not read nearly as much Plato as I intended. This was a rather language-intensive few months. There are a couple things that I have started that are not listed above but I will just record those with next quarter. Lots of reading this quarter. If we just go with pages as a rough guide, I covered 241 in Familia Romana, 28 in Fabellae Latinae, 67 in Colloquia Personarum, 26 in Fabulae Syrae, and 21 in College Caesar (which is way harder to read). That is 383 pages of Latin. I am satisfied with that. I also listened to Quomodo Dicitur a bit. I am not sure of the best way to consume Latin (or Greek) podcasts. The sound quality in this podcast is good most of the time, which helps a ton, but I still have a lot of vocabulary to learn to be able to understand well on my first listen. I gave all of those episodes listed above two or three listens and that helped comprehension a good deal, but I suppose that I need to sit down with a dictionary at some point to progress. But since I listen to these as I drive, it is a bit hard to have a dictionary at hand. At the very least, I am able to pick up some new words when they define them, and I hope the repeated exposure of words that I do know is doing me some good. Finally, I have continued my weekly Latin tutoring, which has been mostly centered around reading through College Caesar. But that is good, because Caesar is rather difficult for me, so I need the discussion. As for my first love, Greek, most of my time was spent in reading. The Septuagint and Phaedo reading was almost all first-exposure reading for me. Everything else was something I had read before. In terms of page count, 75 in the Septuagint, 7 in Phaedo (weak! ), 103 in True Story, and 228 in the Greek New Testament, for a total of 413 pages of Greek. I do not plan to do less GNT reading but do need a bit more reading outside of that. I just need to finish that time machine. I also did a little Greek podcast listening with ὁ διὰ νυκτὸς διάλογος. I will be participating in a class with the creator of that in just a few weeks. I have the same difficulties with this podcast as the other. I feel like I need a dictionary, but can’t given that I usually listen while driving. Maybe I should just mix it up with some driving listening and some dictionary-at-hand listening. I will continue my study in Q1 of 2019 (already begun!) though I know better than to promise specific goals given my recent history. I will continue my Latin tutor time and hopefully finish up College Caesar. I am also taking a ten-week course on Coversational Greek (Koine). I will continue working through LLPSI because it is useful for me, I enjoy the books, and because Seumas suckered me into reading through the series with all its accompanying volumes. I have two volumes down, two in progress, and twelve to go before the end of 2019. No problem, right? Next quarter I also intend to spend a fairly consistent amount of time on memorization. I tried it a little this month and enjoyed it. The goal would be to memorize some extended selections of Latin and Greek. For Latin, I started with the opening of Caesar’s Gallic Wars, and for Greek, I have chosen to start with Second Timothy. I am not sure how this activity fairs from the standpoint of language acquisition, but I am certain it won’t hurt me. At the very least I will memorize some of the Greek New Testament, which is certainly a good thing. I also memorized the first century emperors and their reigns. That did not take very long and though memorizing dates can be a little dull, it is extremely helpful for understanding overall historical context and sequence. So I will continue on with that memorization activity as well. And finally, for this next quarter I am going to switch to using a spreadsheet and will start doing something like Seumas recommends here. This was possibly my best language study quarter and in general a good year. Though I was planning on cramming in a lot of study at the end of the year during the break, I actually took it pretty easy. I needed a little break. But now I am ready for my next quarter.